This is fast growing and a very high yield crop, producing plant. It has sweet pulp, taste like Kiwi Fruit. ~ Fruit Juice ~ Smoothies ~ Yoghurt ~ Sherbet ~ Ice Cream. The Fruit is used, in a majority of foods because of the magenta / red colouring and the magnificent tropical taste of the flesh, with the kiwi texture, it is also known to be used in sweets and medicine, the fruit is sweeter than the Vietnam White Flesh, the Fruit are a Medium Too Large in Size. The Ruby Red, or Thailand Red/Purple Flesh is defiantly a fast growing and high yield crop, producing plant. Had been cultivating and propagating Dragon Fruit, also known as Pitaya for over 6 years. 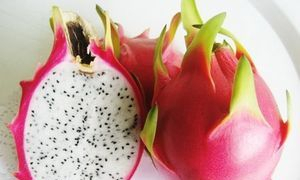 Dragon Fruit SA…started with less than 10 Dragon Fruit Plants, more than 6 years ago and thru hard work, passion and dedication, we are proud to say, we have managed, to help create a couple of Dragon Fruit Farms in South-Africa and around the World. All our dragon Fruit farmers are automatically part of our FREE, dragon Fruit Forum. By helping each other and advising another we create a positive market, and setting an overall quality and standard for all that wants to be part of this wonderful venture. Our objective is not to dominate the dragon fruit / Pitaya market or community in SA., the market is big and wide enough for all farms and farmers and nurseries to work together. Background on the Plants that we have Cultivated for about 7 years. 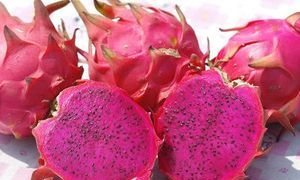 Dragon Fruit South-Africa affiliated with The ProHealth Shop. 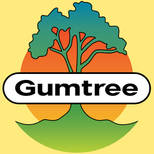 One of the Best Natural and Organic Health Stores in SA.